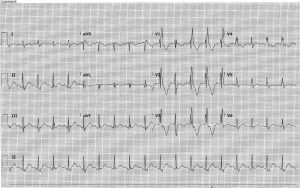 ECG 5: 9yo girl with 1 month of intermittent fevers, fatigue. No cough, SOB, vomiting, headache, joint pains. Saw PMD 2 weeks ago and diagnosed with viral syndrome. Saw again 2 days ago and had CBC, CMP, ESR, UA – all unrevealing. Comes into ED with c/o syncope. No pets, only recent travel is a week of local summer camp 2 weeks prior to onset of symptoms. Negative PMH, FH. ECG 4: 7yo with known WPW, h/o previous SVT treated with adenosine successfully, alert but c/o chest discomfort, BP 84/34. 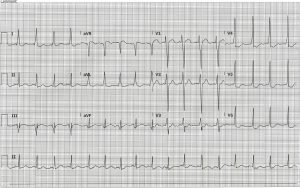 Is it OK to give adenosine? Verapamil? 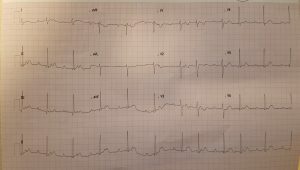 ECG 3: 16yo boy involved in auto vs. bike accident, c/o left chest pain. CT showed left 1st and 3rd rib fractures, large left pneumothorax, left pulmonary contusion. 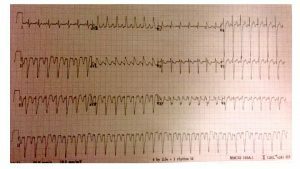 How to manage 29 day ex-35 weeker with BRUE-like episode + choking?